On a corner within the San Pedro Market, in the section specializing in rice with egg, I saw a crowd of people around the casera, vendor, Milagros. 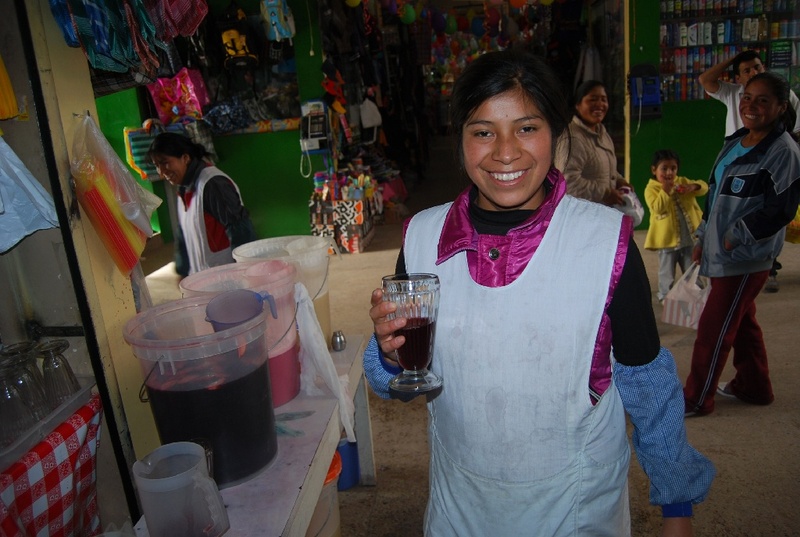 She helped everyone by serving them a range of what in Cuzco we call refrescos. This word means drinks made from fruit, corn, and other ingredients. 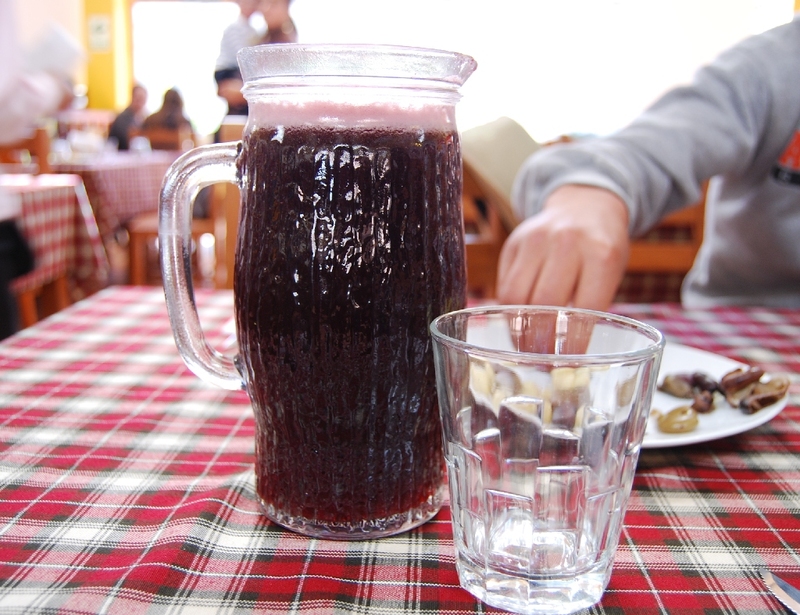 Seeing her, I could not resist trying that dark, refreshing and tempting drink called chicha morada with diced apples floating on top. 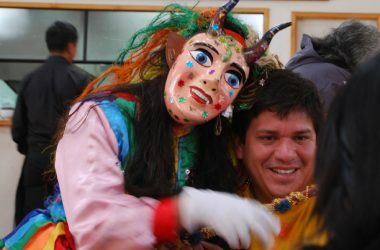 Casera Milagros serves people in the order of their arrival. I waited a bit, but on trying the chicha morada I fell in love with its dark purple color like royalty, its sweetness and its rich flavor from the purple corn lets off for this chicha. Within the market the venders have three to five transparent buckets filled with different drinks such as quinoa chicha, carrot chicha, passion fruit drink, apple drink, and more. 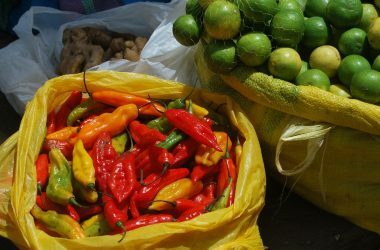 But among all these the one that stands out the most is chicha morada. Within the bucket you can see the apples floating, ready to be served. While the name chicha can refer to fermented corn and other ingredients, it can also describe un-fermented soft drinks like the refrescos described above. 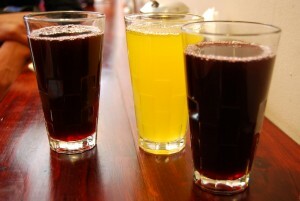 In contemporary times chicha morada (purple chicha) is consumed in three forms. There is the homemade chicha, the pre-made chicha, and the bottled product. The bottled chicha is prepared industrially in large scale. It is sold in either small or large bottles. In contrast the pre-made product is also made industrially but is sold in packages whose content is powder. It is made from sugar, acidic ingredients, and artificial flavorings to which one only has to add water. 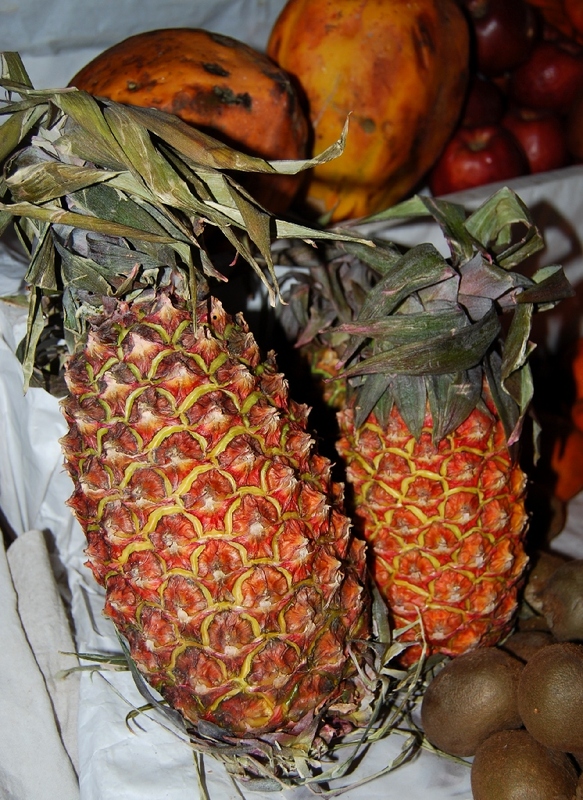 Nevertheless it is widely consumed because of its low cost and sweet flavor. Neither of these two forms achieve the characteristic flavor of the chicha made in the traditional way by soaking purple corn, not do they have the antioxidants that come from the indigenous, Peruvian purple corn (called culli or ckolli). 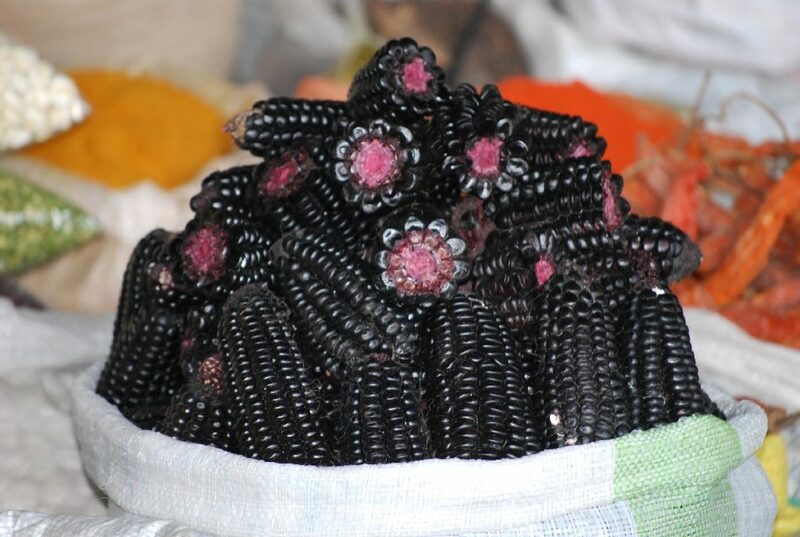 Chicha morada as well as corn is a healthy Peruvian inheritance for all of humanity. The anthocyanins contained in the purple pigment of the corn act as antioxidants in the colon. Besides regulating the level of cholesterol in the blood, they are argued to regulate the levels of blood sugar. They are anti-inflammatory, improve the circulation of blood through the body and help in the regeneration of tissue while avoiding capillary fragility. 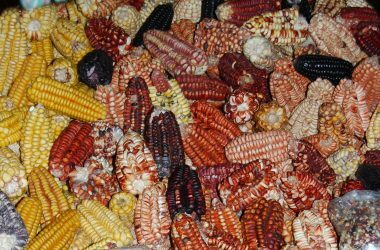 This natural coloring in the corn has beneficial potential for good health since it is a strong antioxidant with medicinal properties that are demonstrated in international studies. The traditional way of making chicha morada is to boil the kernels of purple corn in water with pineapple peel and slices of quince. To this is added a pinch of cinnamon and cloves. Once boiled the preparation is passed through a sieve and is chilled before sugar, lime juice, and diced apples are added to taste. 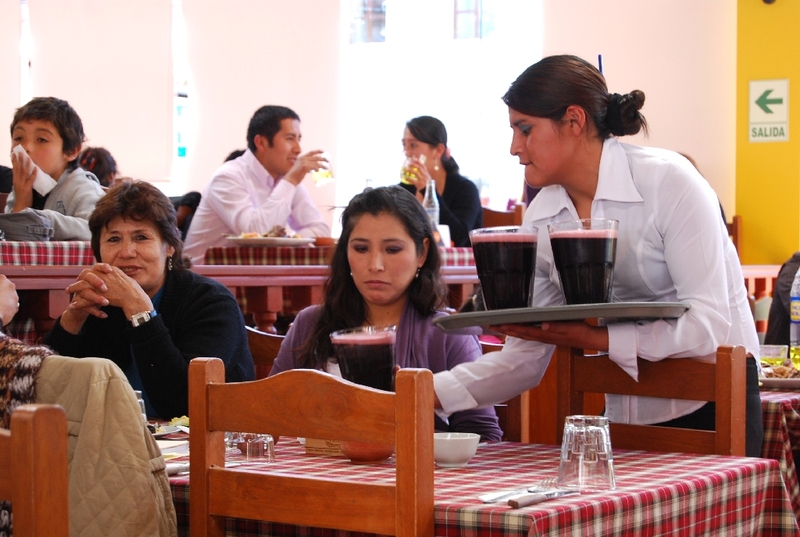 The sale of chicha morada in Cuzco is almost obligatory in restaurants and self service establishments where fast food is offered. Without doubt this drink is the most emblematic of Peruvian gastronomy. 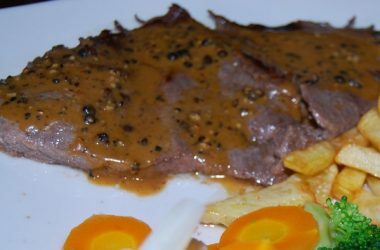 It appears in many occasions and is an excellent companion to traditional Cuzco dishes. 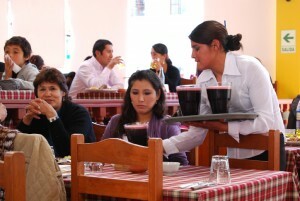 In Cuzco chicha morada is very popular as is the pudding, the mazamorra morada, made from purple corn. Both are known for being very nourishing. Now another purple corn drink, the hot api from Bolivia, is entering our market with vigor. In the Andes and in Peru in general people have the custom of slaking the thirst with this popular drink chicha morada. People know its healthy and refreshing power. querido Walter, mi maestra es Mandy Law en Archeologia. 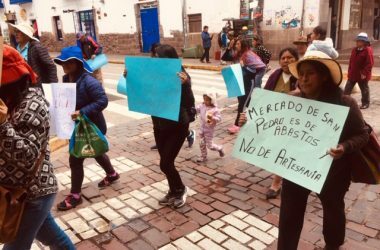 nos a dicho muchas cosas buenas de usted, y me da pena que no voy a poder ir a peru con el resto de la clase. hey i am in mrs laws archaeology class and i was wondering what is your favorite part about preu? Hi! I’m in Mrs. Law’s Archeology class and we have herd quite a bit about you. I just wanted to say that I’m grateful for putting up those orphanges. Have a good time and i hope to see you in peru! Hey Im Courtney! Im so excited to go to peru with you guys! !